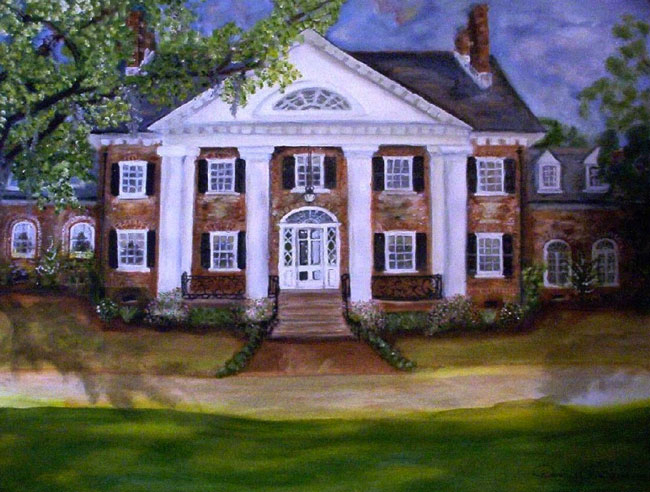 Bonnie Doone includes Ashland Plantation, Chessey Plantation, Dehon Plantation, Neyle Plantation, and Sterling Plantation. The house is built in the Georgian style and has 32 rooms, including 12 bedrooms. Circa late 1960s  Plantation purchased by the Charleston Presbytery of the Presbyterian Church of the United States. Laurie Hanna Jones shares, "The Charleston Presbytery purchased the plantation and did a tremendous amount of renovation of the Big House and the other buildings which still stand today. They also built the in-ground pool and a recreational building which stands behind the caretaker's house. A bridge was built to what is known as Vesper Island and benches were built there for worship." Number of acres  At one time, the plantation comprised 15,000 acres. The present acreage is 131. Although Sherman's troops burned the house in 1861, rice continued to be grown on the plantation until 1911. The rice fields are visible today. Suzanne Cameron Linder, Historical Atlas of the Rice Plantations of the ACE River Basin - 1860 (Columbia, SC: South Carolina Department of Archives and History, 1995), pp. 79-80.